This entry was posted in Nigeria and tagged BDM, Brethren Disaster Ministries, CCEPPI, Ekklesiyar Yan’uwa a Nigeria, Nigeria, Nigeria Crisis Fund, Nigeria Relief by Jenn Dorsch. Bookmark the permalink. I was greatly relieved to read of the work being done by CCEPI, Rebecca Dali’s project. It is a mission of mercy. Herb and I heard her at Annual Conference in Columbus (2014), and her stories were heartbreaking. Our Nigerian Brethren are being tested by fire, and they are proving faithful. We in the West need to help them from afar. She and her volunteers are the hands and feet of Jesus. 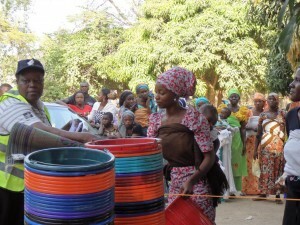 After reading this inspiring account of the CCEPI distribution to the Nigerian refugees, I couldn’t help wondering whether there were any leftovers for those who weren’t registered?